Last Tuesday and Wednesday I stayed in with Ru both days whilst Win was at nursery. Ru’s eyes and nose were streaming constantly and his cough was terrible. I took the opportunity to reorganise my craft supplies and came across copious amounts of brown envelopes. An idea was born: ‘The brown envelope advent calendar’. Not exactly genius I know, but it got me excited! 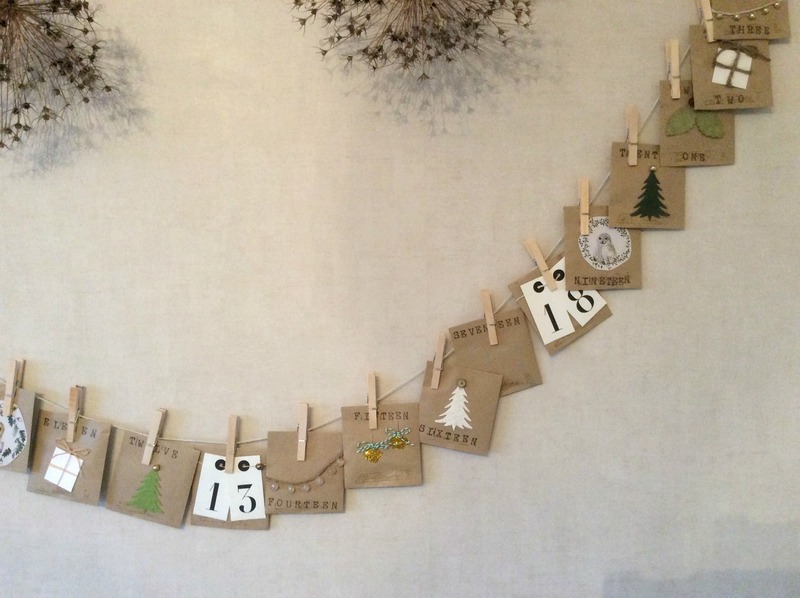 Last year I used a branch as an advent calendar which worked quite well, but I love changing things around, especially when it costs next to nothing to do so. The only thing I bought were the pegs (90p) and the gold coins (£2). This is so incredibly easy, but the end result is really effective. You can also be as adventurous or as simple as you like. Before switching your glue gun on you will need to come up with a few ideas to get you started. I came up with baubles, Christmas trees, wrapped gifts, owls, stars, number tags, fairy lights (beads) and holly, but candy canes, wreaths and snowmen would also be lovely (along with anything else Christmassy). Alphabet stamps and ink pad – mine is from Hobbycraft and I use it a lot. An array of tags, beads, string, ribbon, bells, buttons, paper, card, cut outs, sequins and glitter. 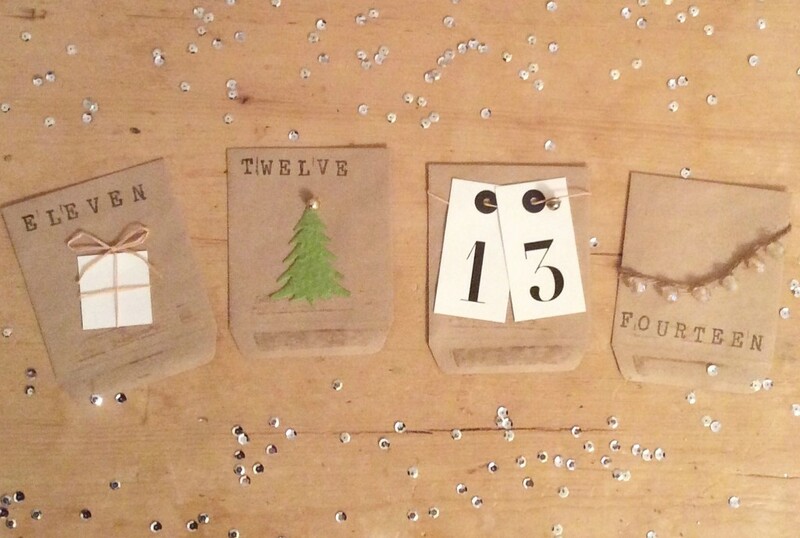 Cuttings from wrapping paper, or Christmas cards can really come in handy too. I always think the best thing to do, is lay everything out. 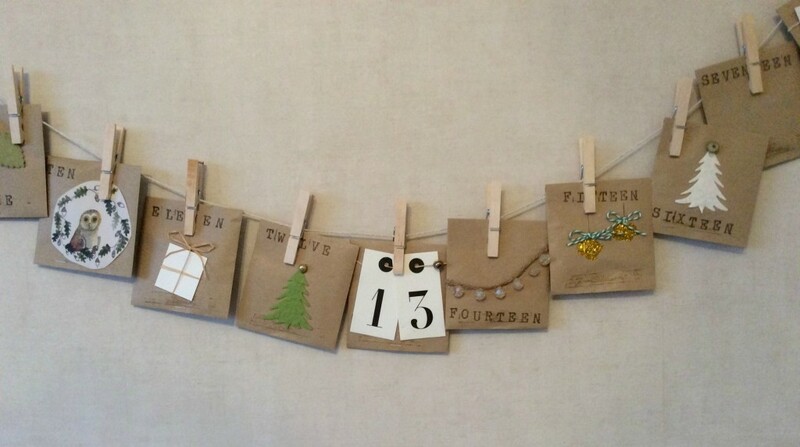 Lay the 24 envelopes out and start working on three or four envelopes (not consecutive) – think about spacing, colours and where the number will go. 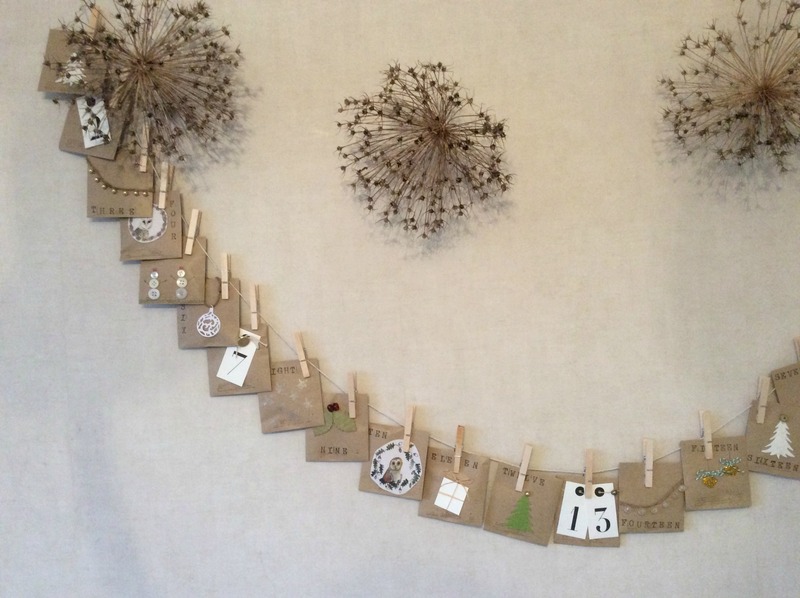 Once you have decided you are happy with your designs get stamping and gluing. (I really think a glue gun is the only way to go with this project. PVA and other craft glues just won’t hold as well, or as quickly). After completing three or four – take another three or four and do exactly the same, making sure designs are varied (particularly if they are consecutive). Once you have finished your envelopes and everything is dry, write out 24 activities or acts of kindness – one for each day. In ours I wrote the kind things my three year old came up with, but also added in things I knew we would be doing such as: ‘Put the Christmas decorations up’, ‘Make a gingerbread house’, ‘Go and see a show’ and ‘Go carol singing’. 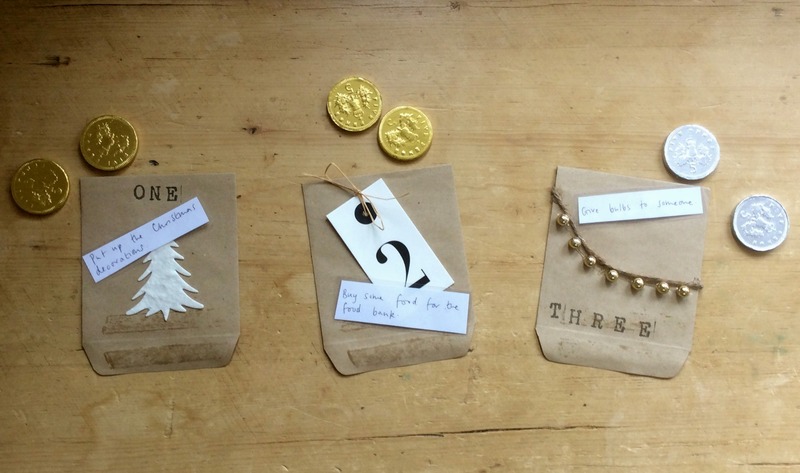 Place one activity plus one gold coin (or two in our case) inside each envelope and close. Do this for all 24 envelopes. I knew Win would love this bit so I saved it for us to do together. 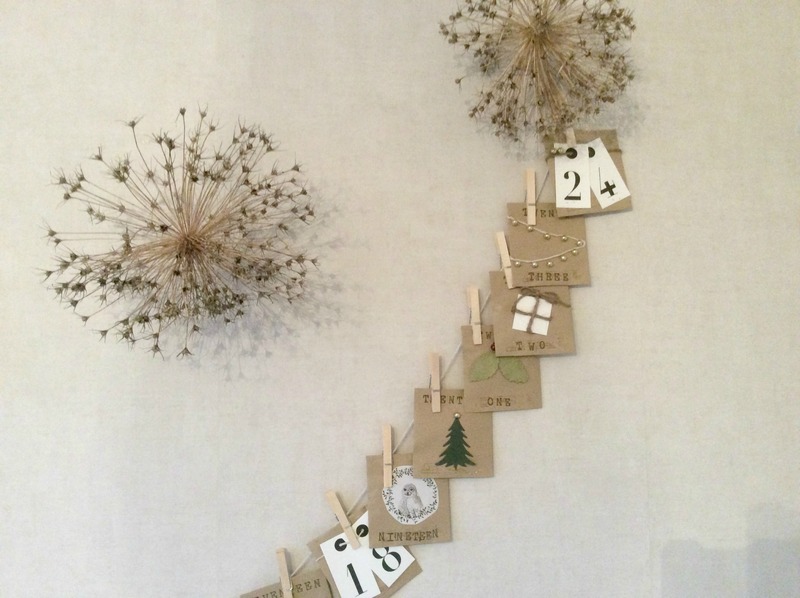 You’ve probably already decided where your advent calendar will be going, so all you need to do now is measure out a piece of string and attach it to a wall. 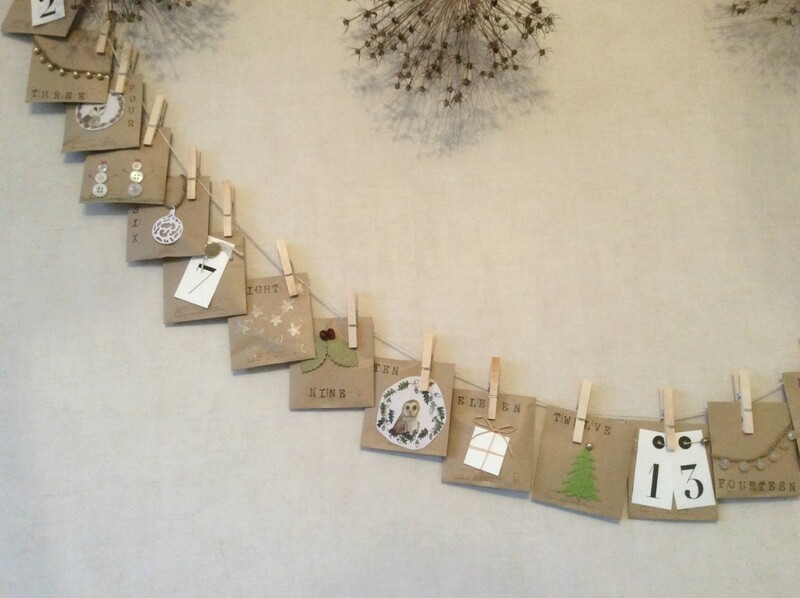 The finally step is to attach each envelope to the string in numerical order with a wooden peg. Step back and enjoy your project…and don’t open until the 1st December! Tip! I actually did the whole calendar with the envelopes upside down. I really should have done them the right way up so there would be no need to lick the envelopes. It just means they can be reused, as the pegs would keep them firmly shut. Apologises for the bad pictures – I couldn’t get the light to work for me at all. I also can’t part with my allium heads so it does look rather busy. Oh this is gorgeous! I love the speed of the glue gun too! Thanks for linking up with #CreateMakeShare. This is lovely, so simple, but such a special thing to do. Much better than the basic chocolate ones I get them every year. I’m feeling inspired to get my glue gun out.